Made By: Tabacalera A. Fuente y Cia. Occasionally, a cigar comes along that is unique in every way—interesting blend, innovative shape, intriguing story—and, at the same time, can still maintain the classic standards of excellence. 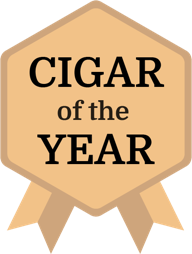 This is the case with the Arturo Fuente Don Carlos Eye of the Shark, Cigar Aficionado's 2017 Cigar of the Year. The blend is based on the original Don Carlos cigar (which was released in 1976), but altered a bit for this particular release. If you want to know exactly what makes the Eye of the Shark different from the regular Don Carlos line, you're going to have to use your imagination. The Fuentes are quite guarded as to the particulars of the blend. It's enough to know that the wrapper is from Cameroon and the interior tobaccos are well aged and grown in the Dominican Republic, which is the basic recipe for most Don Carlos cigars. One puff of the Eye of the Shark, however, and you'll know you're smoking an elevated blend—something comfortingly familiar to many Fuente fans, but with a slight twist. People who are familiar with brand owner (and now, company patriarch) Carlos Fuente Jr. know that he blends instinctively rather than by strict formula, especially when creating unorthodox cigars like this one.The shape adds to the intrigue. Eye of the Shark is neither box-pressed nor conventional. Rather, the bottom half is pressed and the upper half tapers into a regular, rounded belicoso—a demi-press. Fuente has used the shape before, so as quirky as it may seem, it's recurred in other lines, but only in limited quantities. As for why it's called the Eye of the Shark, it's most likely due to the overall form. If you look at the cigar horizontally, it resembles the body of great white shark. Once the four corners of the box-pressed foot are fully lit, the Shark begins to express itself immediately. In addition to the range of baking spices and citrus notes found in most Don Carlos cigars, each puff communicates additional layers of complexity, kind of like a bonus track to a favorite album or an unexpected epilogue at the end of a classic novel. More intonations of nuts and leather unfold before a warm, lingering finish of cedar and cider. Simply put: we did not want this cigar to end. In 2016, Fuente's father, Carlos Fuente Sr., passed away. He was the Don Carlos, and active with the company until the very end. You'll find the words "The Man's 80th" printed lovingly on the side and on the lid of each bright red box. Eye of the Shark was released in 2016 as a tribute to Sr. and his contributions over the years to the cigar world. The Eye of the Shark is Cigar Aficionado's No. 1 cigar of 2017. Sadly, Sr. is not here to see or receive the accolade, but his spirit is definitely alive in the smoke.